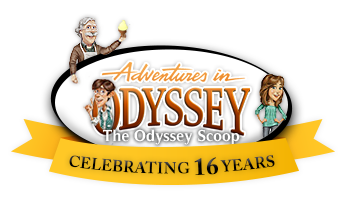 We’re pleased to announce that The Odyssey Scoop is still around after all these years! On December 22, 2016, our site reached its sweet 16th birthday, and it wouldn’t be possible without all of our loyal fans and followers. It’s been a great ride and it isn’t over yet! 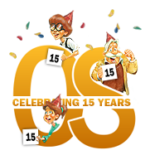 Of course, every year we like to thank you, our fans, for everything you do, from emails, to your involvement… and for your love of Adventures in Odyssey. We would have given up a long time ago if it weren’t for the loyalty of Adventures in Odyssey’s fan base. Also, we cannot forget to stop and thank our friends at Focus on the Family and the Odyssey team for all they do to keep such a quality radio drama alive for nearly 30 years. It’s hard to believe we’ve been around for about half of the show’s run! Share with us! What is your favorite feature here at The Odyssey Scoop? How long have you been visiting us, and what can we do to improve? Let us know in the comments below!